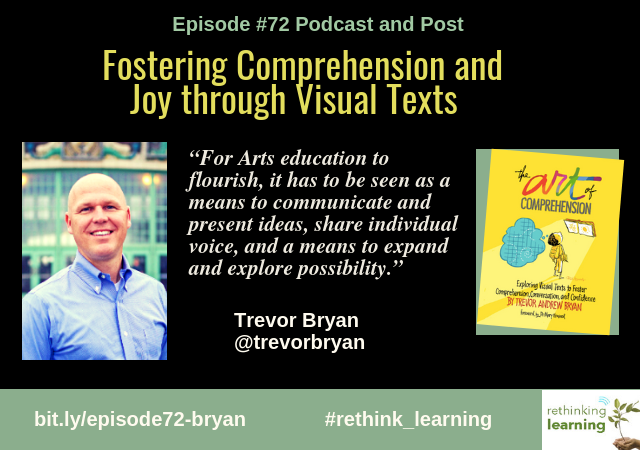 Trevor Bryan is a K-5 Art Teacher in a New Jersey Elementary School who has two core beliefs about the arts. The first is that the arts foster joy and connection, especially when times or topics are tough. And the second is that the arts help us to make meaning of our human experience. 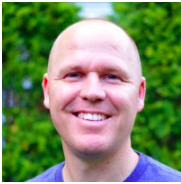 Trevor is a teacher, author of The Art of Comprehension and co-founder of Four O’Clock Faculty with Rich Czyz for educators looking to improve learning for themselves and their students. Enjoy Trevor’s journey! I grew up in Glen Rock, New Jersey, which is a small town in the northern part of the state about 20 minutes outside of New York City. 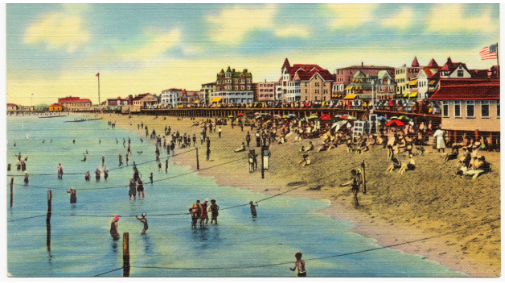 I currently live down at the Jersey Shore, close to Asbury Park, which is the town Bruce Springsteen helped to make famous, with my wife Laura, and our two children, Johanna (12) and Owen (7). We live close to Ocean Grove to which is a national historic town that is about one square mile with more Victorian homes than Cape May. My parents have a summer home there. We’re a bike ride away so we visit them often. 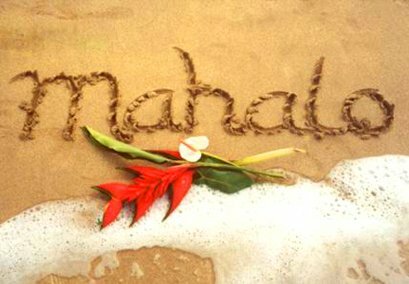 We love living down near the beach and enjoy the art and great music scene there along with a bunch of wonderful restaurants. My school experience was pretty good for the most part. I wasn’t always the best student but I was decent. I was really good at doing my own stuff but not always that great at doing the tasks that I didn’t find too meaningful. I had some wonderful teachers. I had a really rich writing experience in 6th-grade that ties into my work right now. I was probably one of the first students in New Jersey to go through the Writers’ Workshop model. 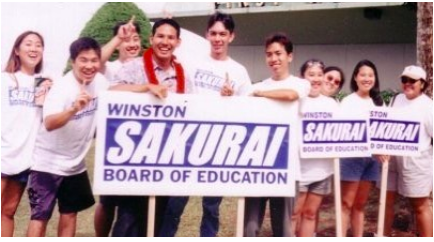 My art education experience was where I had super art teachers with a lot of support. Because we were only 20 minutes outside of New York City, I had a lot of opportunities to see museums and shows on Broadway. Since high school, I always wanted to be a teacher. As an art student growing up in an upper-middle-class community there weren’t a lot of artists or makers as models. I loved the arts but the only artists I knew were art teachers and my parents were educators so I went into education. I originally thought I was going to bring the arts into the regular ed classroom and studied at Bank Street College of Education to be a regular ed teacher in elementary school. I quickly realized that I wasn’t going to be able to do the arts as a classroom teacher. There wasn’t enough time. It wasn’t structured that way, and I didn’t want to do all the stuff that classroom teachers have to do. That’s when I decided to go back to the art room because I missed the environment. I never regret that decision. Thankfully, New Jersey has continued to support art educators. Eventually, I figured out how to bring the arts into the regular ed classroom through my work which has turned into The Art of Comprehension. I met my wife teaching middle school a couple of towns over. I left there when I had the opportunity to work part-time and took the time to write a children’s book. It was a disaster. I went back full-time in another district and then moved on to Jackson where I am now. They are very supportive and allow me to explore some paths that I feel fortunate to have gone down. It’s where my book, Art of Comprehension, came into fruition. 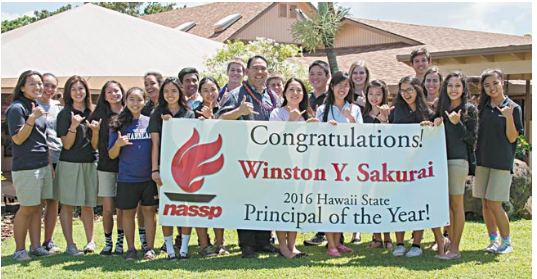 I’m really happy with where I ended up and with the administrators, I work with. Not to mention, it’s where I met Rich Czyz. Rich Czyz and I taught together for a few years and explored all kinds of stuff together. It was really a fun relationship where we kind of tried all kinds of ideas with the kids and pushed boundaries. Although we never really talked about it back then, I think what drove our explorations was a sense that we thought there had to be better ways to do things. So we searched for those better ways. He ended up going into administration so our professional lives separated but we still talked regularly. Then a few years ago, we started at Four O’Clock Faculty just to work together and explore again. 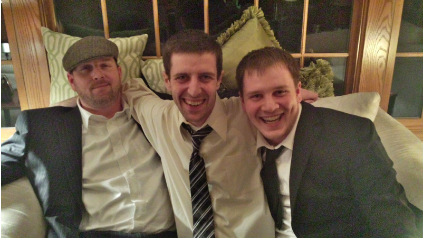 Rich had the idea of starting the blog and so we started it. This is the fourth year since. We always said that we would keep doing it as long as we enjoy it. We still do and I think both of us feel like it helps our writing. 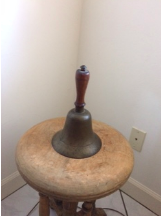 The blog has been a great way for both of us to find our voices. I think it’s fair to say the blog has significantly impacted our book projects. The hashtag is #40CF and we share what we think about and learn from other educators on Twitter. 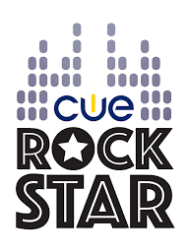 Rich and I really believe that is our job as educators is to help kids find their voice. Adults too. 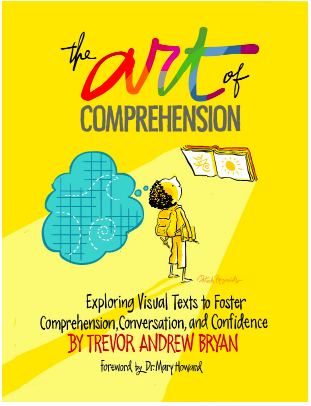 The Art of Comprehension: Exploring Visual Texts to Foster Comprehension, Conversation, and Confidence is built on the idea that nearly all students, non-readers, striving readers and beginning readers can decode visual texts such as illustrations and paintings, effectively. 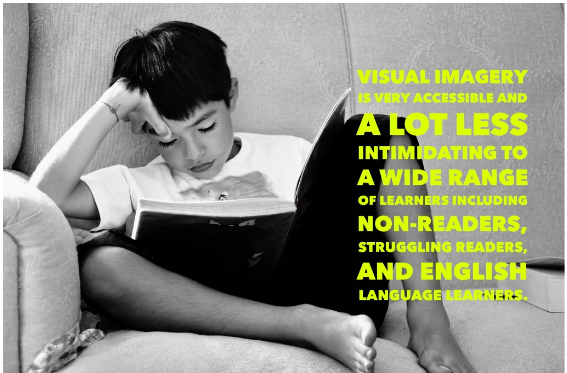 Because these learners can decode visual texts it means they can also engage with meaning-making skills, such as inferring, using text evidence, recognizing symbols and patterns, identifying themes and big ideas and making rich, meaningful connections. Thanks to Peter and Paul Reynolds for believing in my mission and supporting me to help make my mark. I hope readers enjoy the eclectic collection of art and illustration by Peter Reynolds and other art from 19th-century masters. 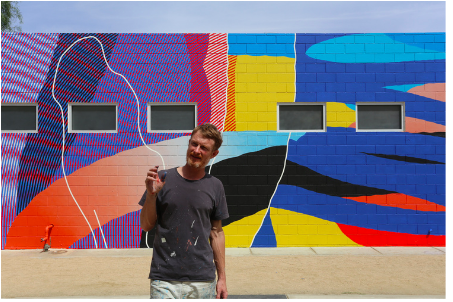 Trevor Bryan has two core beliefs about the arts. The first is that the arts foster joy and connection, especially when times or topics are tough. And the second is that the arts help us to make meaning of our human experience. 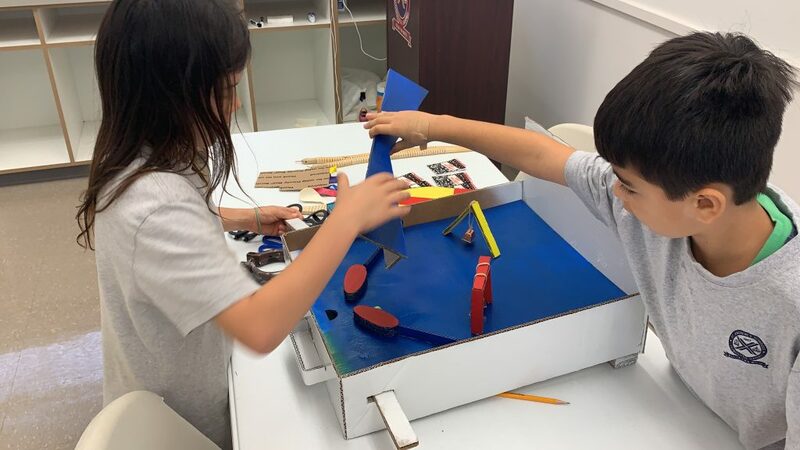 These beliefs, along with numerous, meaningful arts experiences as a student, established Bryan’s North Star as he entered into teaching 20 years ago: to show how the arts could positively and meaningfully impact every students’ academic career. 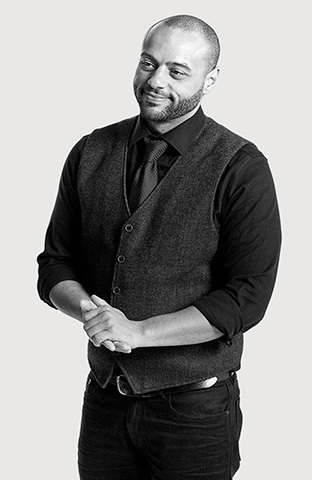 For the first 10 years of his teaching career, Bryan struggled to transform his beliefs into meaningful educational practices and to clearly demonstrate the relationship between the arts and academics. Then, he had a breakthrough. Bryan started to explore the relationship between viewing artwork and reading comprehension skills. This is when his beliefs and practice finally began to converge. 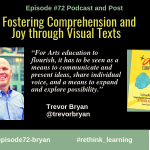 Through this exploration, Bryan found ways to share his passion for the arts and to show how they can be used to support the academic growth of all learners. 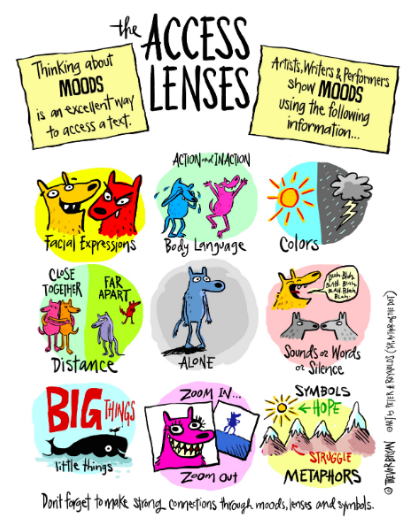 At first, this work solely focused on using visual art to teach reading comprehension skills. 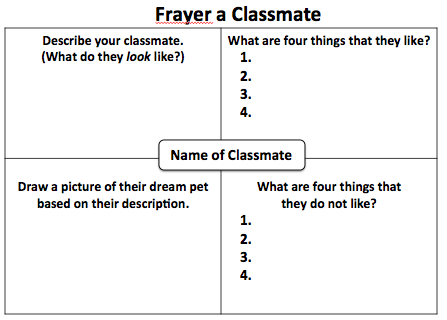 But slowly, Bryan began to see how visual texts could also help students explore and strengthen their writing. Ultimately, Bryan’s work has become about helping all students to comprehend their own lives and help them develop and strengthen their unique voices so that they can flourish doing work that truly matters to them. Bryan’s journey has been a bumpy ride, filled with ups and downs. It is his passion for the arts (reading and writing included) that provided him the fuel that enabled him to keep moving forward, find his purpose, and learn to share it with others, which he does whenever he can. 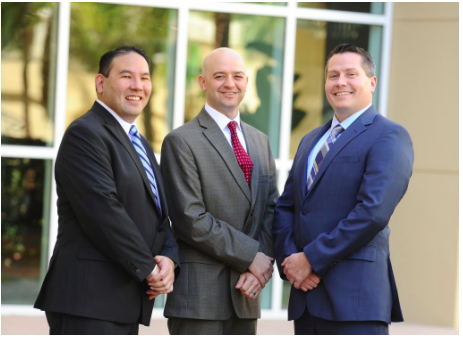 Over the last several years, Bryan has presented at numerous conferences, both large and small, and has worked with teachers and school districts across the country. He is grateful that his life’s passion has become his life’s work and looks forward to sharing them with both you and your students. Bryan lives at the Jersey Shore. 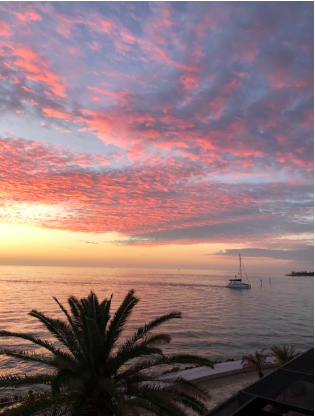 When he’s not creating, he enjoys long runs on the boardwalk, beaching it with his family and friends, great restaurants, and the thriving local arts scene. Bryan can be contacted through his blog fouroclockfaculty.com; through Twitter, @trevorabryan; or through email at trevorabryan@gmail.com. 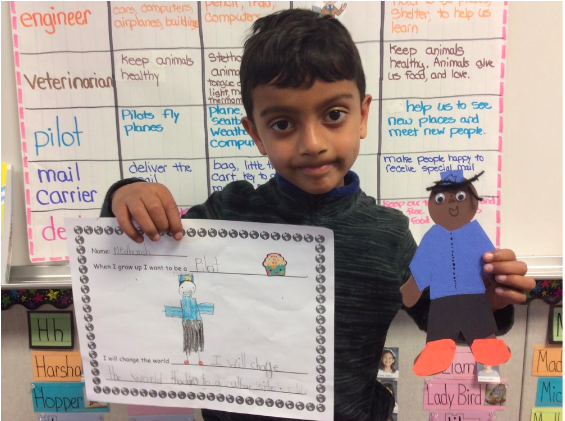 Kindergartners will be world changers. Right now they are learning to share, cooperate, and take turns. It is inspiring to think that one day these amazing little humans will make our world a better place. 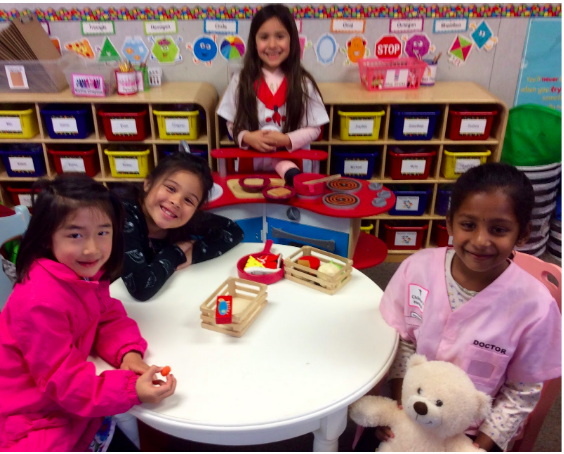 The kindergartners at De Vargas Elementary School, in San Jose, California, recently completed a Project Based Learning (PBL) Unit called World Changers. 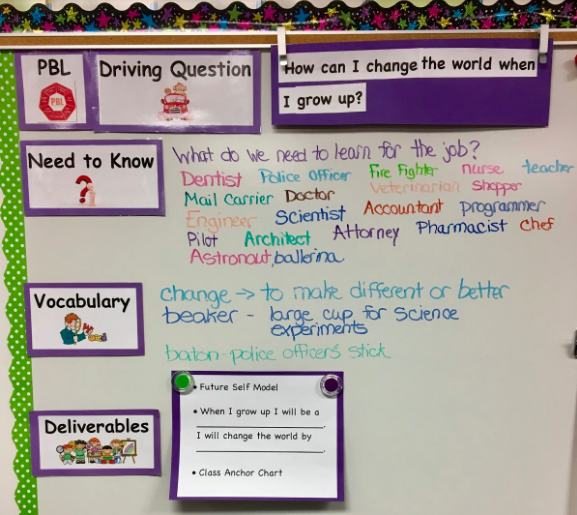 What is PBL? It is a teaching method in which learners gain knowledge and skills by working for an extended period of time to investigate and answer an authentic and engaging question. 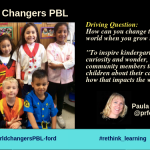 PBL enables the learning to be personalized so that each learner has access to and ownership over their learning. Academic standards are embedded into each PBL. 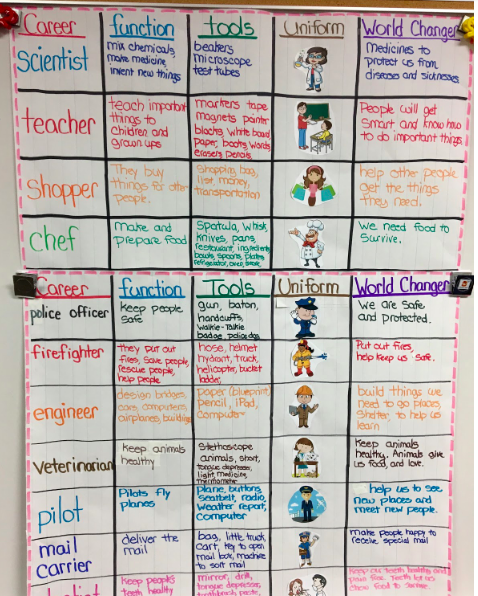 The kindergarten social science standards include learning about now and long ago, learning about the community, and learning how to work together. All these standards were embedded within this PBL. In addition, key vocabulary and sentence structures were taught as most of our school population are English language learners. 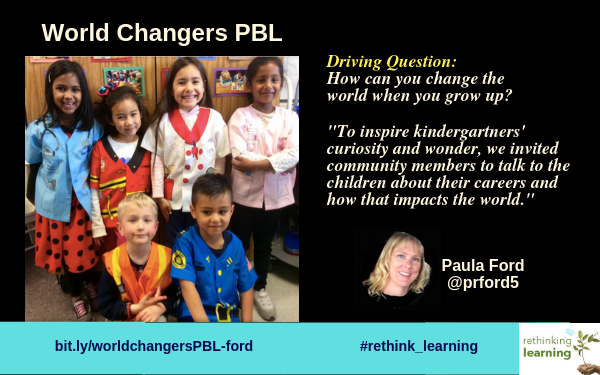 The Driving Question for this World Changers PBL was: How can you change the world when you grow up? This is a big question for little kids and one that they took seriously. 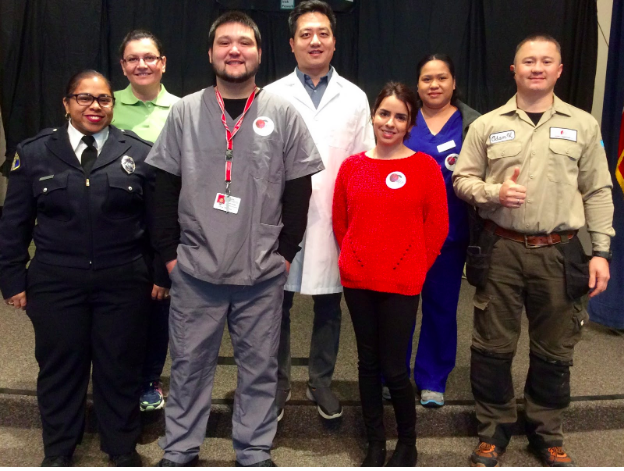 To launch this project and give them the hook to inspire their curiosity and wonder, we invited community members to come, dressed in their professional wardrobes, and talk to the children about their careers and how that impacts the world. 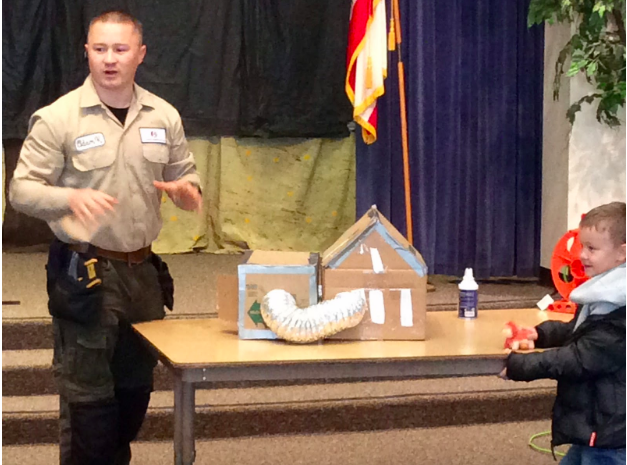 This community member talked about the importance of heating and cooling homes. After learning from people in our community, we returned to the driving question for our PBL. We brainstormed things we need to know and new vocabulary needed for this project. We kept track of this information on our PBL Wall. 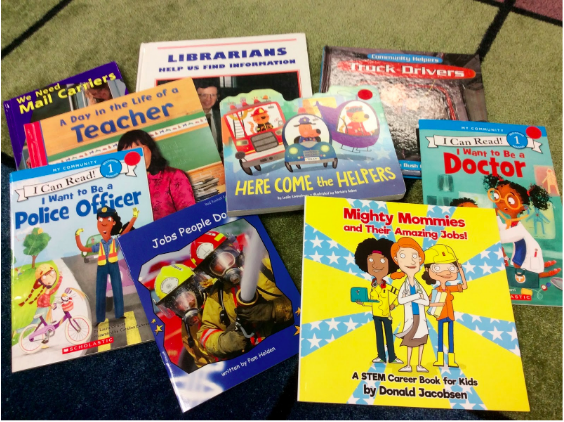 The children had opportunities to choose books on a variety of career topics that interested them. We found some video clips to aid in this discovery. More discussion took place, as they learned about different careers. They noticed that some careers that were important in the past are not needed presently. We talked about how and why those changes took place. 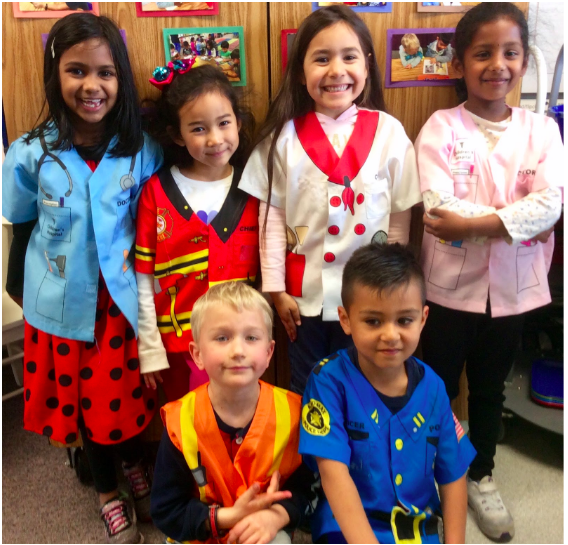 During playtime, they enjoyed dressing up and trying on different career choices. Towards the end of the project, the children chose the future career they felt would fit them best. They created a model of their future self and stated how they will change the world. The children displayed these products in the Guided Learning Center for learners, staff, parents, and community to see. They also documented all their learning on a digital portfolio that is shared with their parents. Through this project, the children learned about different kinds of careers, and the many ways in which they can change the world. They are now looking towards the future, and they are excited about what they can do and how their actions will affect others. It is my hope that this PBL will inspire the children to continue to think about how they will become world changers. Paula Ford graduated from the University of California at Davis with a Bilingual Cross-Cultural Language and Academic (BCLAD) multiple subject teaching credential. She also has a master’s degree in Curriculum and Instruction and Early Childhood Education. She has been teaching for over twenty years. 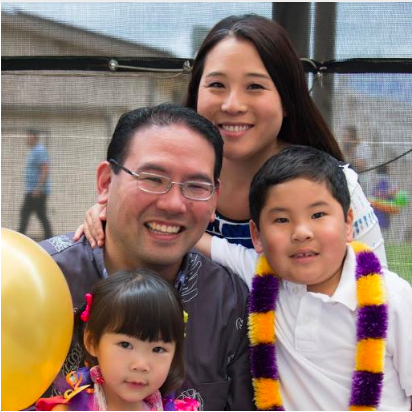 She began her career in bilingual education and then moved to teach second language learners. Paula taught kindergarten, first grade, third grade, and has been a resource teacher for grades transitional kindergarten through fifth grade. The majority of her career has been teaching low-socioeconomic English language learners. Currently, Paula is teaching kindergarten at Manuel De Vargas Elementary School, and she absolutely loves it. 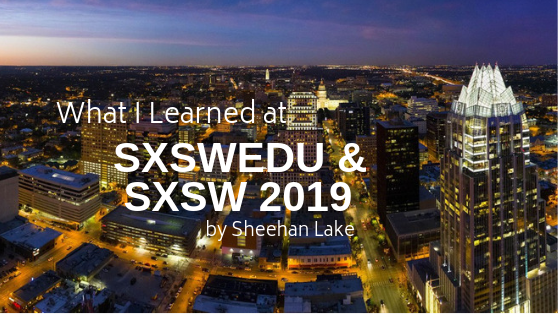 This is a cross-post from Sheehan Lake in his 3/20/19 LinkedIn post “What I Learned at SXSW about his first visit to SXSW EDU and the first few days of SXSW. I met Sheehan and had the greatest conversation with him about life, the world, and what he has learned at SXSW EDU. Sheehan attended my session and included it in his post that he forwarded to me. Then we talked about how much he learned and so we agreed that I could cross-post his post to share with my PLN. by Sheehan Lake, CTO at Aurora North Software Inc.
As part of this year’s personal and professional development initiative, I decided to spend a week in Austin, Texas to attend SXSW.EDU March 4-7 and the first few days of SXSW Interactive March 8-10. This was my first South By Southwest. SXSW was a wonderful experience full of eye-opening sessions, great conversations, interesting mirrors, and inspiring new connections. 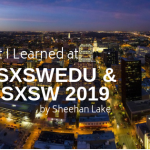 Here are some of the highlights, comments, and reflections from my week at SXSW 2019. Wellness fosters natural positive personal growth. Operating in a creative space that promotes individual development or learning is significantly harder when fundamental elements of physical comfort and survival are challenged. High stress of any type triggers the body to operate in survival mode and is directly counter-productive to output and creativity. Burning out is the opposite of thriving. An environment with compassion and integrity is fundamental to reducing stress, removing the survival response, and enabling progress towards productive change. Thriving in life, succeeding in business, maturing as a human and embracing learning all integrate with a sense of wellness, safety, understanding of self, intention and healthy community. Establishing and maintaining wellness at an emotional, energetic, physical and psychological level is a fundamental challenge confronting an array of demographics affecting a variety of areas of our society. Learning techniques and perspectives on education are changing rapidly. Organizations, institutions, non-profits, and businesses of all types face challenges integrating new ideas and approaches with engaged interest from the communities they serve. Creative collaboration and design thinking approaches provide a flexible framework and safe environments for the development of vested interest from several parties. Collaborative environments enable empowerment through positive change while embracing messy failures. Successful change and messy failures are the yin and yang of operational evolution through which real progress is built. Gathering perspectives and problems in a supportive space empowers the “Disruptive Question” or the “Disruptive Solution” to emerge. Genuine integrity, honesty, vulnerability, and compassion allow us to connect to the humanity in each other. Inspirational humanity and unique individual expression are beacons of light in a sea of social momentum, colonized content and evolving media. The integration of several different individuals’ motivations, social drivers, community intention and shared information into creative collaboration fuels disruption and can empower catalysts for change. The defined intention, mission statements, and goals can function as roadmaps for the productive output of a collaborative effort. Communities of creative empowered individuals drive collaborative intention. Productive results-based recognition and reward systems can really help develop individual growth along with community supported learning environments. It’s okay for large-problem solutions to take time to develop and implement. Smooth seas do not make great sailors. The most dynamic and interesting people learned how to learn, learned how to learn from failure, value their experiences and continue learning. In today’s world information access is no longer the barrier to knowledge. Interpretation, analysis and critical thinking around the integration of information provide new perspectives of learning and advancement. 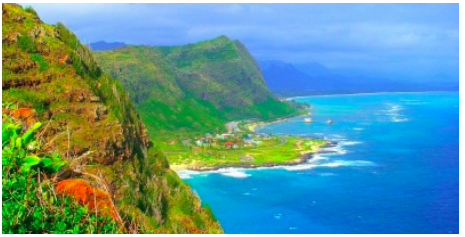 Unlearning the unnecessary and re-imagining from a place of compassionate self-understanding empowers affirmation of positive instinctual growth. It is completely appropriate to be maladjusted to things that are morally, ethically, socially, scientifically or technically just wrong. I am maladjusted to ignorance, racism, hate, and social injustice. Understanding what drives one’s motivations for learning and exploring one’s “why” are essential elements of an individual’s self-development. Challenging and re-challenging one’s motivations is the key to owning, enjoying and embracing success. 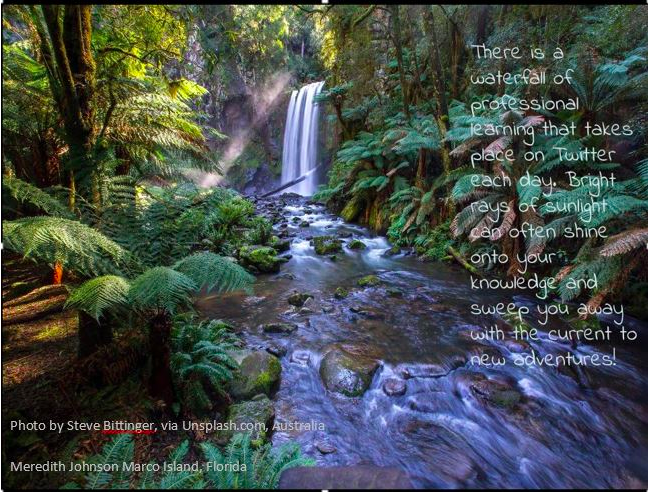 Be present with new connections. Being present in-person enables mutual interpretation of body language and a sense of situational comfort with natural communication cues and eye contact. Exchanging business cards is still cool. Consider handing someone a business card to be a real-life invitation to be a friend. Receive a business card as a gift with gratitude and honor. If someone hands you a business card, look at it immediately!! Try to imprint that person’s name and face with their business card in your memory. Also the card content title, company, name…. can provide instant additional conversation topics. Phones!?!? Try to be mindful, genuinely connecting with new people is even more challenging when either party has their phone in hand. Phones are literally ‘distraction machines’ which frequently specialize in breaking conversation momentum. Play with your phone when you are alone. A phone is also a communication tool – having a handy image of a QR code on your phone that links to your contact information can be very helpful and a quick networking tool. If you set up a personal contact QR code for a specific event, it can be helpful for the recipient if you include the event name in the company reference, its a classy move. When adding people to your contacts list, put the event name and year in with the company or notes. In a pinch, if you are trying to recall a contact you met, you can search in your contacts by the event name to help find that person later. Follow up new connections within 24 hours, attention spans are short. That means you, too! It’s easy to possibly forget a contact or get names mixed up if you don’t continue the conversation thread in a short window, especially if you are at a conference. Follow up again 1-2 weeks after the event and be open for establishing conversations, ideas, and threads that facilitate reasons to keep in touch. If possible focus the conversation thread around collaboration rather than sales. Blockchain, Augmented Reality (AR), Virtual Reality (VR) are incredibly exciting right now and aren’t going away anytime soon. The world is ripe for some accessible applications to support these advanced technologies. New applications in all industries, technologies and learning environments are emerging every day. We will continue seeing an integration of AR, VR, and Blockchain into common ways of working and thinking over the next several decades. Learning to learn and re-learning to learn are the primary skills that need to be focused on in a world where automation is soon likely to be available to assist with many peoples’ current challenges. Allowing automation to solve simpler challenges for us will allow us to advance as a species in many ways. The changes will be awkward and often may not employ enough compassion for those affected. Learning to work with change and accepting change allows us to negotiate and mitigate the stress created around the uncertainty of an evolving future. There are thriving intentional conversations taking place around morality and ethics in the usage of emerging advanced technologies. SXSW in Austin is the hottest urban intersection in the United States for learning, culture, media, new ideas and old ideas re-envisioned for our modern time. Austin is a hotbed of innovation and new entrepreneurial efforts. The Start Up Crawl hosted by Austin’s Capital Factory functions as one of the kickoff events for SXSW Interactive, this event alone has over 15,000 attendees and the entire experience is inspiring on many levels. Partying with holographic DJs and robots is pretty cool! Virtual environments for content data mapping and VR Jedi light saber battles are really interesting, inspiring, and just plain awesome. Yes, seriously! Virtual Reality lightsaber battles, VERY COOL!!! In the penthouse floor of the Omni building in the VIP lounge of the Capital Factory Startup Crawl, I met a rad group of friends who built an app specifically to help find fun via a crew-sourced list of events and parties in Austin the weeks of SXSW. Keeganslist has information and links to help find the best events get on the right guest lists. Thank You, Drew, Chris, and the Keeganslist crew. One of my favorite conversations, while walking the Capital Factory Startup crawl and checking out cutting edge technology demonstrations, was actually about a nonprofit called Fr1ends of the Ch1ldren which is helping the children of Austin directly in a smart and compassionate way. SXSW has evolved from its origins as a ‘music festival’ and its community represents the evolution of expression through expanding communication mediums. Perspectives of the world expressed through spoken word, music, performance, and film provide us a glimpse of the exciting ways artists explore the natural questions of human curiosity…. Who? When? What? Where? and WHY?? 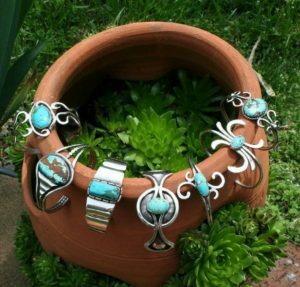 woven through an evolving intersection of self, intention, and community. SXSW provides us a snapshot of our collective visions, a reflection of our modern existence and projections of our future informed by an evolving perspective of our past. Being true to one’s self, intention and community will never go out of style, just like integrity. Embrace your individual identity and uniqueness, be seen, see your community and be present with community members. Whenever possible be gentle, mindful and flexible with your intention. 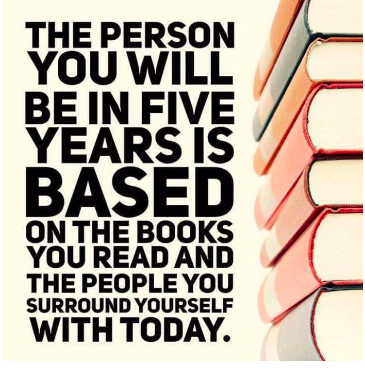 Embrace new connections and choose your tribe wisely. Compassion is still cooler than technology. SXSW is a worthy experience, especially if you want to express yourself or explore your mirrors in our culture. Rachelle Dene Poth is a Spanish and STEAM: What’s nExT in Emerging Technology Teacher at Riverview Junior-Senior High School in Oakmont, PA. She is the host of the weekly #formativechat. Rachelle is the President of the ISTE Teacher Education Network and the Communications Chair for the ISTE Mobile Learning Network. Rachelle was selected as the 2017 Outstanding Teacher of the Year by PAECT and by the NSBA as one of the “20 to watch” educators in 2017. Rachelle is an author of three books. And, by the way, she is also an attorney. I’m lucky to know Rachelle virtually and to get a hug and selfie with her at conferences. 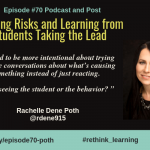 We did this podcast in February 2019 where there were extreme snow storms back east and Rachelle was in a hotel room for a conference. I hope you enjoy this post and the podcast. I am an only child and grew up in North Huntingdon, 30 minutes east of Pittsburgh, PA. When I was growing up my parents worked. Most of the time when they worked, I stayed with my grandfather and grandparents at their farm where they had a large property with fruit, vegetables and underneath was a log cabin. I spent a lot of time by myself because there were no other children in the house to play with. So I passed my time “playing school” or hanging out with my cats. I’m very thankful for how I was raised because we didn’t have the distractions of technology in the 80s. My parents really emphasized school and studying to be prepared. My grandparents helped me with my work ethic and had me pick strawberries on their farm at 6:30 in the morning. When I think back to all of those times I spent with them, the experiences that I had started to form who I am as a teacher and as a person even before I knew I wanted to go into teaching. I did struggle with social studies and my dad would question me on geography. I really had a hard time remembering where things were on a map. My grandmother would quiz me on the state capitals, the times table, and a lot of those basic things growing up. Math was a little bit difficult for me. I didn’t have any struggles in school until the seventh grade when I started to take algebra. Then in ninth grade with geometry. I didn’t know how to study for it. Once I had a handle on that, it improved. I’m not sure that I was that creative in school. It’s interesting when I think about my memories. Do I actually remember this or is it because I see a picture and formed a memory based on that picture? I’ll find artwork or worksheets that I did in boxes my grandparents saved. It’s interesting to go back and see how I was taught to find out who I was as a student. In seventh grade, we had to do an anthology of poems. I had to use a typewriter to type and wrote about 70 poems. I drew on every poem a kind of illustration. But, after that, I don’t remember being creative or thinking out of the box. I originally thought of being a paralegal. I read a lot of books on law and developed this interest in it. When I graduated from undergrad with French as my major and secondary education as my minor, I couldn’t find a job. I was substituting for a while and really enjoyed that. Every interview for a job as a French teacher encouraged me to get additional certification. One of the suggestions was history and another one was math. I thought I could not do either one of those. So I went into Spanish at Pitt and we had to do medical and legal translations. It was then that I started thinking about the law. 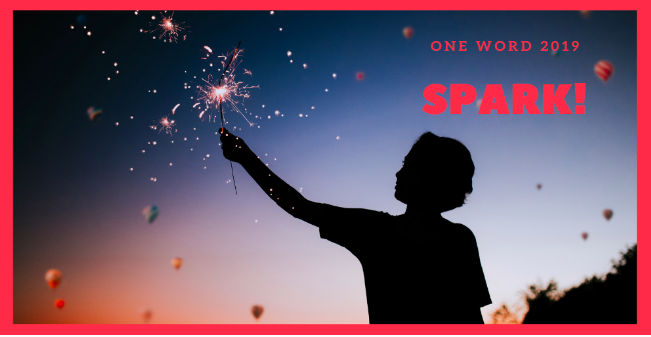 I got my Spanish certification and started teaching Spanish at Riverview Junior-Senior High School in Oakmont, PA I love teaching but I had this idea of personally fulfilling this. I applied to Duquesne University School of Law and didn’t even tell anyone. They have an evening program because I knew I couldn’t take time off of teaching during the day. When I got the letter that I was accepted, I found that it was four years, four nights a week, four different classes per week. For those four years, I still wonder how I did that. Most of the time, I stayed at the school library, went to class, and then back home which was a lot of driving. It was difficult to balance going to school and teaching. I also knew that putting myself out there was because I was invested, I had to do whatever it took. I graduated in June 2006, took the bar that July, and passed it. I’ve done some work on the side, but I’m not practicing. It’s a choice that if I want to pursue it, I can. I do think going to law school pushed me to think in multiple and different ways to problem-solve and become a better teacher. I became more aware of student behaviors and communication. There was a situation where one student who I was trying to build a relationship with dropped a crayon. Through my Forensic Science classes, I was able to figure out why the crayon was pushed into the floor and have a conversation with the student about responsibility instead of punishing. I need to be more intentional about trying to have conversations about what’s causing something instead of just reacting. Take a breath. Take a minute. Then think about it. Am I seeing the student or the behavior? I want to know information about the student that I need so I can provide the best that I can provide for them. There are other things I don’t want to know that might form preconceived things about who they are based on behavior they might have had in the past. 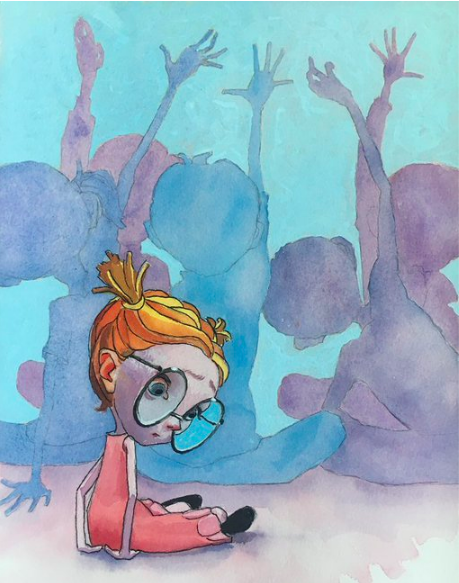 In one of my books, I talk about seeing the students. 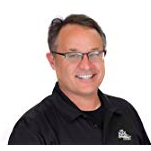 Edugladiators Core Warrior, Pushbound EDU, and I am proud to be involved in several communities including being a Buncee Ambassador, CoSpaces, Flipgrid, an Edmodo Certified Trainer, Nearpod PioNear and Certified Educator. 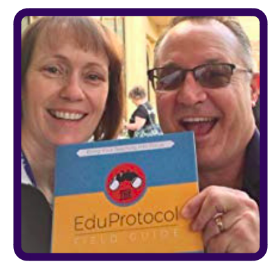 I am an author, I wrote chapter 3 of the Edumatch book “Snapshot in Education 2016” about Blended Learning and a Chapter on Project Based Learning in Snapshot 2017 and Chapter 12 of Snapshot 2018 about the Power of a PLN. I am a contributing author to “Gamify Literacy” from ISTE and the IGI Global Publication of Social Presence, with a chapter on building an online presence for learning and Stories in EDU. 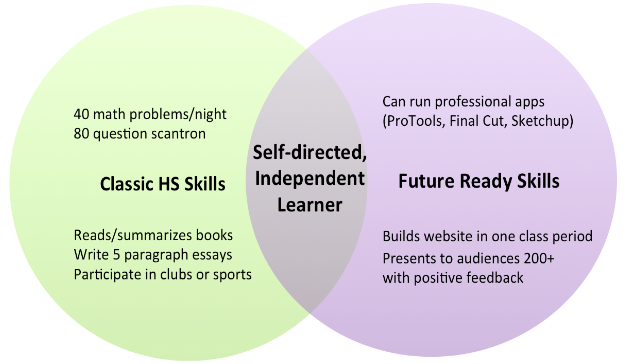 I also blog regularly for DefinedSTEM, Getting Smart and Kidblog, and continue to look for opportunities to highlight student work and student’s voice. 3 Books – Yes, Three! 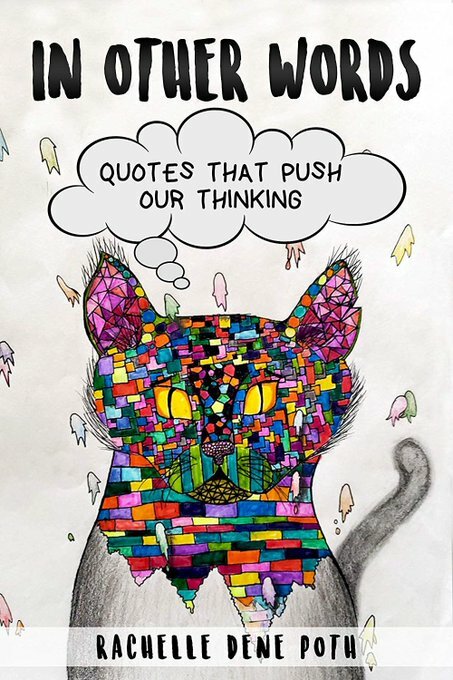 I am the author of “In Other Words, Quotes That Push Our Thinking,” now available. 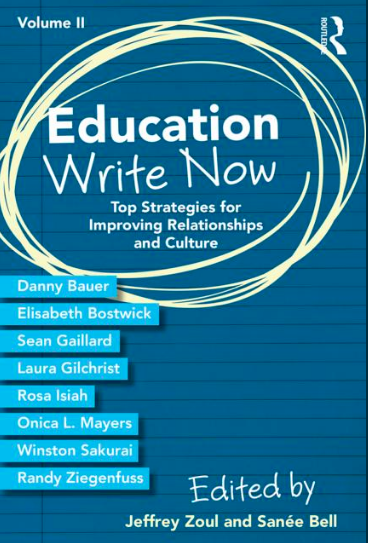 I am also writing two additional books due this year, “The Future is Now” with Edugladiators Publishing. Ver excited to have several guest contributors to these books, two student chapters as well as many illustrators sharing their work in the books. 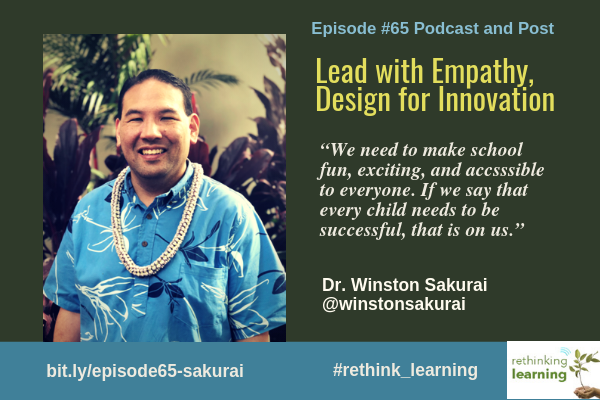 I am currently working on a book to be published through ISTE, tentatively titled “Creativity Unleashed,” due later this year. Rachelle Dene Poth is an EdTech Consultant and teaches Spanish and a course called STEAM: What’s nExT in Emerging Technology at Riverview Junior-Senior High School in Oakmont, PA. She is also an attorney and earned her Juris Doctor Degree from Duquesne University School of Law and has a Master’s Degree in Instructional Technology. 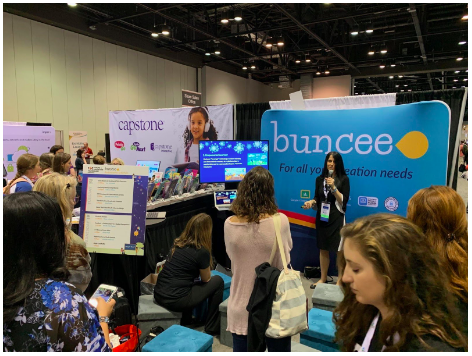 Rachelle has presented at conferences such as ISTE, FETC, iNACOL, PETE&C, PSMLA, ShiftinEDU,ST4T, Summer Spark, TCEA and additional local conferences, on technology and more ways to benefit student learning. 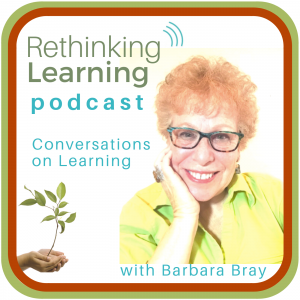 She is the President of the ISTE Teacher Education Network and the Communications Chair for the ISTE Mobile Learning Network. Rachelle was selected as the 2017 Outstanding Teacher of the Year by PAECT (the Pennsylvania Association for Educational Communications in Technology, the PA affiliate of ISTE) and by the NSBA as one of the “20 to watch” educators in 2017. Ira Socol is Senior Provocateur and Learning Environment Specialist at Socol Moran Partners LLC. 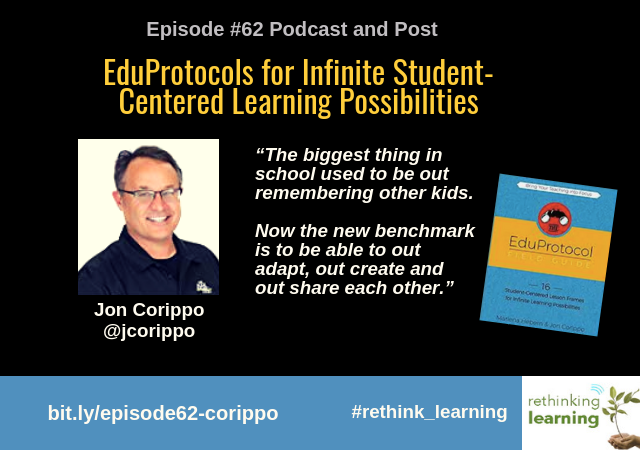 He is a co-author of Timeless Learning: How Imagination, Observation, and Zero-Based Thinking Change Schools with Pam Moran and Chad Ratliff. 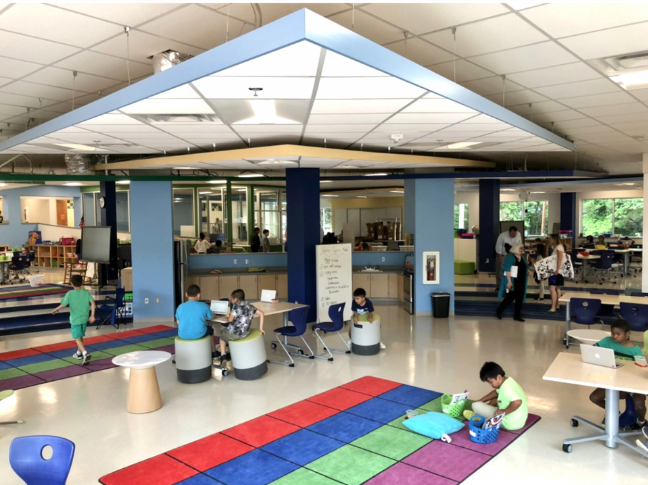 Ira presents nationally and internationally on the need to radically change the four technologies of school – time, the division of students and content, spaces, and information and communication tools – in order to give all students an opportunity to succeed. 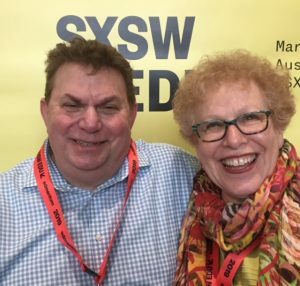 I was lucky to have a selfie with Ira at SXSW EDU. Enjoy Ira’s journey. I started my journey in education in some problematic ways. School was never my favorite thing. Classrooms are not my favorite places. The structure of school never really worked for me. I started out in an urban setting outside the Bronx in New York, the first city north of the Mason-Dixon line to have a Supreme Court desegregation rule. I went to a K-6 elementary school that was a huge place of 1200 students with 5-6 classes that had 30-36 students in each grade level. It was a place where teachers had a lot of independence to try a lot of things. Even though I didn’t have a particularly good time in that school, I also knew a lot of people were trying to find solutions and new things. I deeply appreciated that and wrote a novel a long time ago that includes part of that in the story. The failures I experienced were not the fault of educators not trying. I was lucky enough after middle school to end up in a brilliant alternative high school that was created by some local teachers in New Rochelle, NY. Neil Postman who had had just written Teaching as a Conserving Activity built that then was called a “School without Walls”. There were really no requirements credits, we had to take the NY Regents exams at the end of a required class. Other than that, we were able to learn on our own, with another, with a group. How we got the knowledge base was entirely up to the student. What I learned is that it put a lot of pressure on you. Teachers would say if you don’t want to do it that way, then do it another way. That forces you into a lot of adult thinking and makes you really process things. One of the things I did to help pay tuition was security tours around the neighborhood for incoming freshmen. In doing that, I met a number of officers from the 88th precinct. From talking to them, I found a way to contribute every day to society as a man in his twenties wanting to have an ability to make an impact. 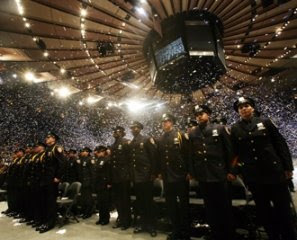 Being a NY police officer was an immediate impact job. It was a time when people were happy to see a policeman. They convinced me to take the civil service test. They were extremely accommodating to my reading difficulties. The police academy education was a remarkable education and I worked in some really crazy environments. I got hurt a number of times. 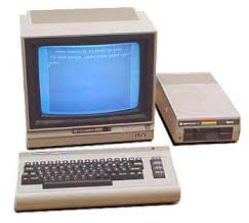 When I was hurt the last time, they handed me an early IBM PC and said to see if they could use this for anything. That was my introduction to computers. I figured that coding was something I could do and also how to assemble and share knowledge. I never fully understood algebra until I really needed to find X (the criminal we were looking for). Then I had to assemble an equation to what we knew to what we didn’t know. Somehow algebra in the Sherlock Holmes way made sense to me. I was always looking for something next to do that gave me that sense of what happens when you intervene at a key moment in someone’s life and change that moment. That search eventually led me to schools. I moved to western Michigan and worked in another of things to pay the bills. Then I went to Grand Valley University through the technology and educational psychology departments led me to assistive special education technology. 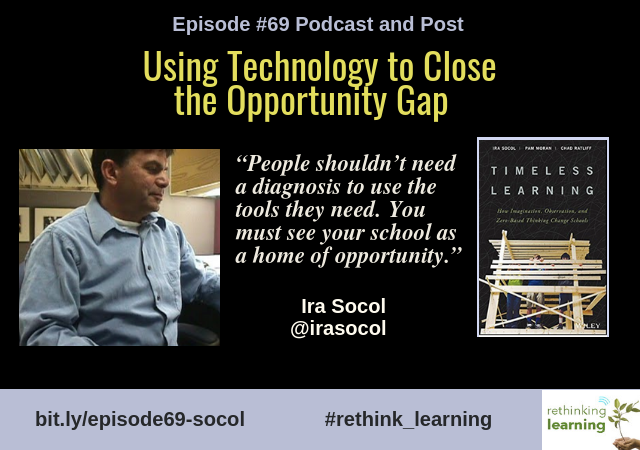 Instead of working in the classroom, I worked in special needs technology in a high school. I was looking for technology that could read to me and that I could dictate to. The technology I found was used for blind people and not appropriate for people with dyslexia. My boss gave me a year to research to come up with a plan to make the campus accessible from a computing point of view. All the assistive technology was hidden in the disabled student office, basement, or library. One of the things I’m very proud of is that we put accessible computers everywhere there were students. People shouldn’t need a diagnosis to use the tools they need. Humans are tool users. When students use tools, they choose it based on what they have to do. You don’t use the same saw to create a table that you would use to cut down a Christmas tree. The environment you’re in matters. If you’re out in the woods, you’re doing one thing. In a machine shop, you’re doing other things. Feelings even matter. Disability and ability are not stable states. You need to know the tools that are available. One of the things we started pumping into the schools I worked with was lots of different choices of things on the computers of the time. Back then we had a variety of text-to-speech readers, browsers. The theory became the most important thing we can leave our kids with is to know how to use their technology to solve their own problems. The Toolbelt Theory is that you assemble your toolbelt and that toolbelt changes as you change. The theory works today. In Albemarle County School District, we always said that with computers there are always three ways to do something. Three browsers, three different word processors, three different text-to-speech systems, and more. We tried to create different tools so students could choose. These are personal learning devices. If a student cannot control or personalize the device, then that is not personalized learning. This was a hard sell at first to some teachers, administrators, and even tech staff. Kids were learning and understood the consequences because they could lose everything on their computer. This is Barbara. I had the most wonderful conversation with Ira and pulled out some interesting conversations. There is more in the podcast. 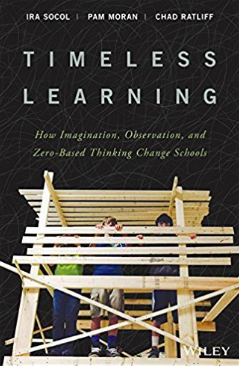 Ira shared resources with me that I want to share with you of his work at Albemarle County Public Schools with Pam Moran and Chad Ratliff especially their book, Timeless Learning. Best to have Ira share his book in this interview with DisruptED TV. Jennifer Casa-Todd is a Teacher-Librarian in Aurora, Ontario Canada, and author of the book, Social LEADia, published by Dave Burgess Consulting. Before this, she spent six years at the District level as a Program Resource Teacher for Literacy and Literacy Consultant, respectively. 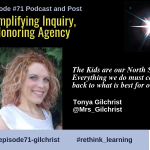 Jennifer guest hosted the #rethink_learning Twitter chat that I co-host with Shelly Vohra @raspberryberet3. 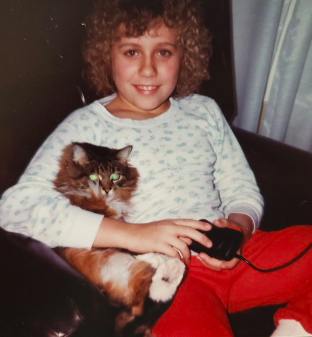 I was able to learn so much about Jennifer in the chat along with reading her book and connecting to her on social media. I am so honored that we had this conversation and even learned some things about her that I didn’t know. 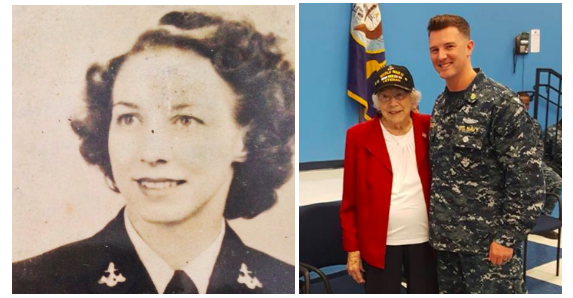 I hope you take time to enjoy her story! I am a mom and wife. My husband, Stewart, is a principal. We have two children, my daughter, Sydney, just started university in a marine biology program. That is what she’s always wanted to do since she was a little girl. My other daughter, Kelsey, is in grade 11. I loved being on Parent council and was for over 10 years beginning when Sydney was in Kindergarten. I even ended up being co-chair of the council because I wanted to be involved and have never looked back since. I had nothing but positive interactions with other parents that are now lifelong friends that I developed as a result of being in the council. We definitely need to create an environment where we are not judging each other. This environment is where we can be there to support each other. Here is something a lot of people don’t know about me. When I entered school when I was four years old, I didn’t speak a word of English. I spoke Sicilian. No one could understand me so they chalked it up to a lack of mental ability. The first formative years in my learning were very tough. I was a nonreader. Learning English while learning to read and all those things that many people had already when they come to school. It’s kind of ironic that I’m a teacher/librarian because no one read books to me when I was young. When I started to learn to read, it opened a whole new world for me. In elementary school also, I was severely bullied. I was cross-eyed, had very thick glasses, and had several operations. I was called four eyes. My mom made my clothes because we didn’t have a lot of money. Those were very, very challenging years. Books were my reprieve because I didn’t have any friends. I lacked self-esteem so I made a lot of poor choices in high school. As a student, I realized I needed to get good grades so school became important to me. In grade 11, I had a teacher, James Stewart, who absolutely enthralled me because he was so passionate about literature. At one point, I had to make a choice between becoming a teacher or expand my part-time job at McDonald’s that I really enjoyed because of the social aspect. 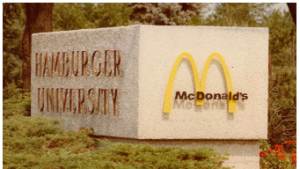 I was offered a company car, benefits, and the opportunity to go to the Hamburger University in Chicago. That’s when I decided that I wanted to be a teacher. I wanted to give opportunities to kids who are disadvantaged in a way that I kind of felt I was. I was a good student from then on and went to university and teacher’s college. I started teaching at a young age, 23, and the first class I taught was a grade 12 media literacy class. I wasn’t much older than some of my students. In fact, one student was 21 who asked me to the prom. That didn’t happen. 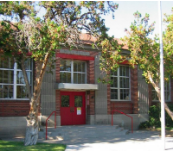 I also taught ESL, English, religious education, cooperative education, and special education all at the high school level at a variety of different schools. When I was at St. Theresa’s where I taught English and Special Education, an opportunity for a program resource teacher came up and worked at the district level for about six years. That was an amazing opportunity because I worked with a small but mighty team, so we did everything. I dabbled in literacy, assessment, and new teacher development. We rolled out a 21c technology learning program for our teachers at all of the 128 schools in our board. 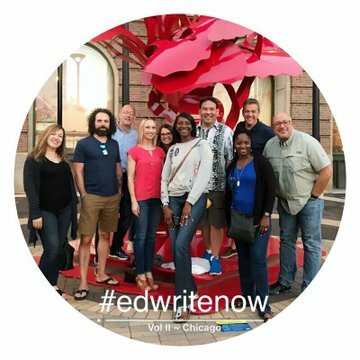 I got to work with some incredible K-12 educators. After six years, I really missed the classroom and being able to implement ideas I had for the students. Then I worked with some teacher/librarians in my district who were all incredible and realized this was what I could do. It is very similar to what I was doing at the district level, but it would be in a school. I applied twice and the second time was successful and have been here at Cardinal Carter Catholic High School in Aurora, Canada for three years. My first year was very tough though because I incurred a concussion on October 31st and then was off for the rest of the school year with a 10-month recovery. Now I’m feeling blessed to be almost 100% recovered. Why does digital leadership matter? 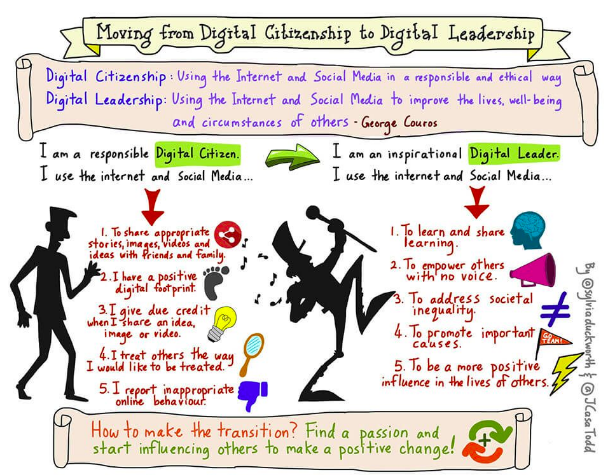 Digital leadership is actually a concept I borrowed from George Couros (@gcouros) who is an incredible mentor in my life. I tell this story in the beginning of my book. 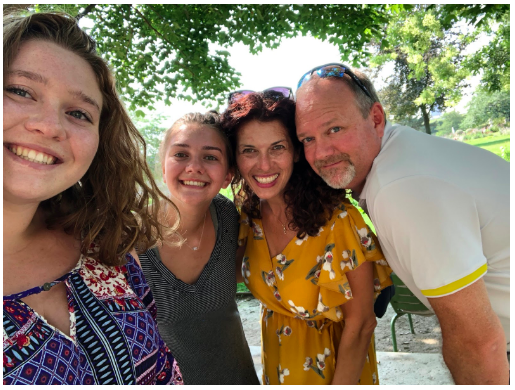 My daughter was on an interview and asked “what social media are you on and what will I learn about you if I go there?” When I reflected on this question, I realized I did not mentor my own child when it came to social media. Rather than showing her what she could do online, I prevented her from doing things and thought I was controlling her use online. Actually she figured it out how to get around the safe search I had put on her phone. It was George’s definition of digital leadership that using the vast reach of technology and social media to improve the lives and the circumstances of others that had a great impact on me. What if we change our stance and our students’ stance toward social media was on digital leadership? What might that look like? In my journey, not every adult was like me. 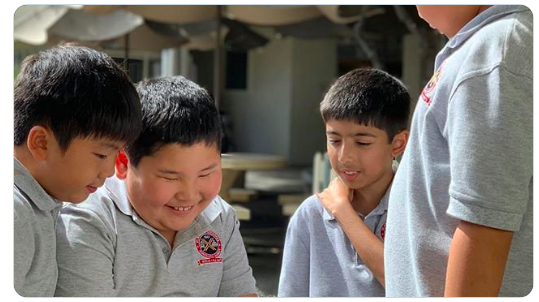 There were so many students who showed leadership online and were being supported around some of their passions and ideas by adult mentors not always teachers. There is a chasm when students know there is a possibility for doing good online where so many students go online only for entertainment. Since 2014, I have seen incredible changes in how we are listening to student voice, the ability to mentor students with class accounts, and the growing reach of students on social media. I continue to celebrate and share the students who are doing positive things online and shine a light on them. The more all of us do this, the better off we will be. How did you come up with the title, Social LEADia? Coming up with a title for a book is the hardest thing ever. I maybe threw out a thousand possibilities and asked my PLN (Personal Learning Network) for support. I remember texting George @gcouros on a regular basis where we were both share many titles and he came up with Social LEADia. That was it! We both knew it. It was a play on words. Social Media, Social LEADia kind of rhymes and I’m talking about digital leadership. So that’s how the title was born. 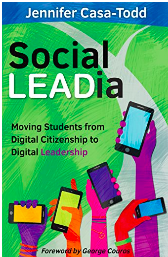 Check out the companion for my book, Social LEADia at https://www.socialleadia.org/ that includes Flipgrids that connects to each of the chapters along with some of the students’ stories. 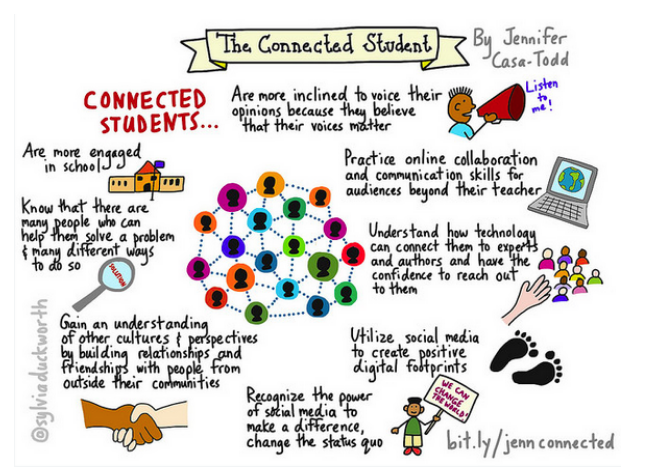 Why does social media need to be a part of teaching and learning today? Because it is part of our world. I know we are fearful, but social media is a literacy, reading and writing the world. Stanford University did a study in 2017 showing that most middle school students couldn’t tell the difference between a credible news source and one that was sponsored. When I consider how digital citizenship can be taught in context with a class account really being able to show kids that social media is a place to learn and share their learning, to empower others, and to have a powerful influence on others. We are doing that mentoring for them by showing them what appropriate use looks like in our classrooms. Digital citizenship lessons can’t be just one class at the beginning of school, it needs to be an ongoing conversation. Banning mobile devices and to say that this is not our problem is easier for schools. We absolutely have a distraction problem with our students. There are always a few students who pull out their phones when it is not appropriate. I think self-regulation is huge. To me, it’s an inequity issue. All of us including parents need to emphasize effective media use. If we don’t, then who is teaching our kids how to do this? Some of my kids have told me that they have been on YouTube for over a decade. This generation of kids has probably been on social media entirely by themselves without adult mentors. I worry about the huge chasm between the kids that have mentors and the kids that don’t. It’s complicated but we just have to engage in courageous conversations to figure out how this is going to work. There are many positives and so many ways to learn using these powerful tools in their pockets. 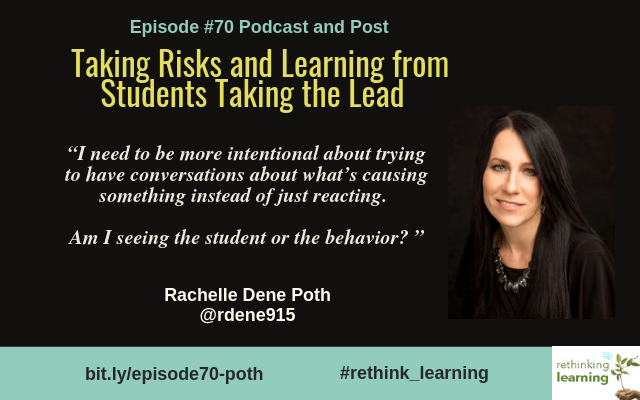 If we’re not showing them as educators how to use them to learn, who are showing them? This is Barbara. Make sure you listen to the entire podcast. Jennifer explains about parents views on social media and how to build communication in and out of the school using social media. She puts on workshops for parents who have tons of questions. Jennifer has opened the door for great conversations that need to happen to everyone in the school community. She even created with BreakoutEDU a game for Social Leadia as a team building, book study. 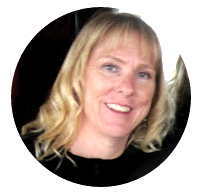 Jennifer works with teachers from Kindergarten to grade twelve in practically every subject area to integrate technology in the classroom, to support literacy, assessment, and differentiation, and to promote twenty-first-century competencies. She also had the privilege to write curriculum for the Ministry of Education of Ontario’s 21st Century Learning office as well as the Catholic Curriculum Corporation and is currently studying at the University of Ontario, Institute of Technology with a focus on social media in education and Digital Citizenship. 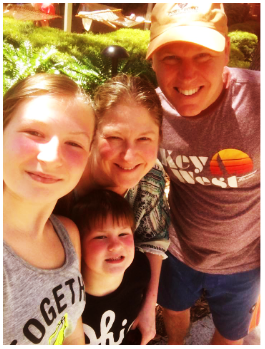 Jennifer has been the co-chair as well as an active member of the Parent Council for over a decade, bringing parent and school communities together for a variety of issues. 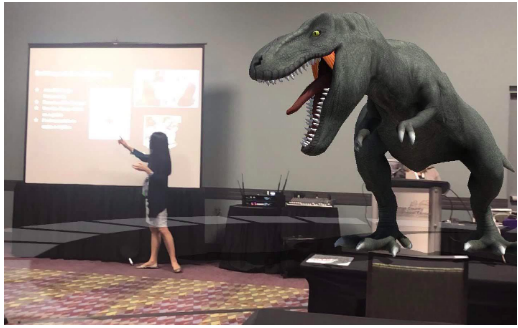 I have also worked closely with the Bully-Free Alliance of York Region with whom I initiated a panel discussion, “Fears, Cheers, and Unclears: Parenting in a Connected World.” She is also the lead organizer for the Digital Citizenship Summit, Canada happening in Fall of 2018. 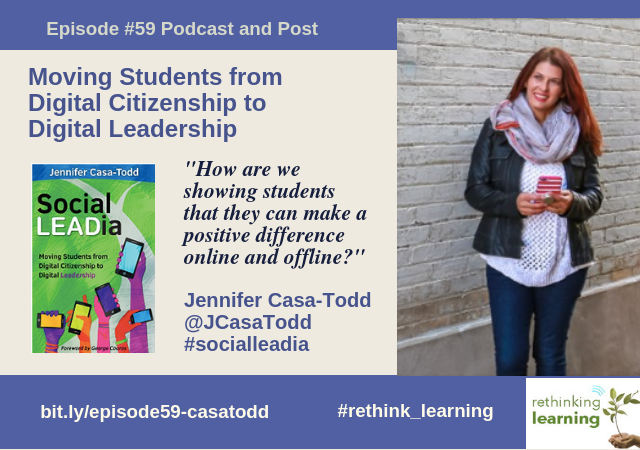 Jennifer is the author of Social LEADia: Moving Students from Digital Citizenship to Digital Leadership It is full of examples of students who are leveraging social media for good, and the teachers who are empowering them to do so.